Mondays tend to be quiet days, right? Not in New Orleans! My couch host, Abdulla, arrived home at about 9am. He had fallen asleep at his friend’s house after having a drink. He only had one, but works as a paramedic, so refuses to drive after any alcohol. So he got home and was napping/reading, and I went off to explore the city. I loved walking down Esplanade Rd to the French Quarter. It took about 20 minutes and it was quite hot and humid, but I loved seeing the plants and vegetation and all the amazing houses. The architecture is brilliant, and I can easily imagine having a writing room/library in one with a few kids running around in the big yards and *sigh*. 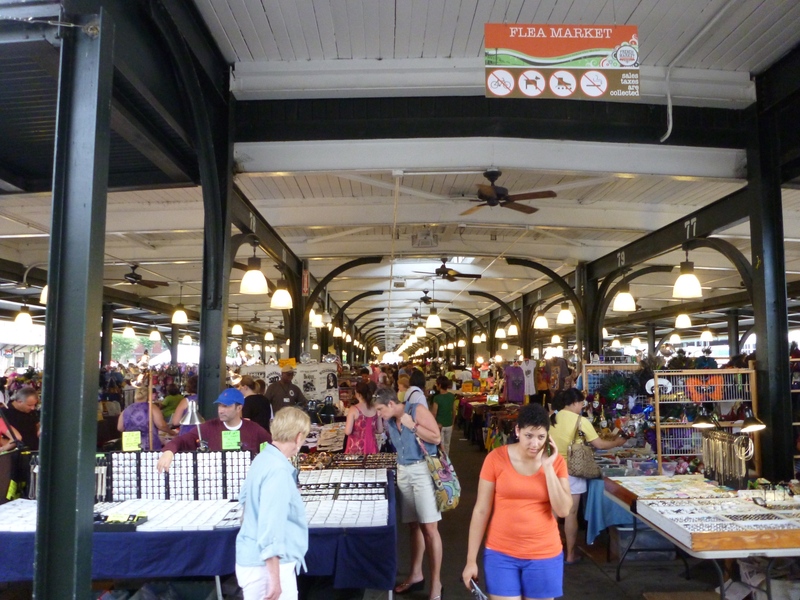 After poking around the French Quarter for a while I visited the French Markets/flea markets which was lots of fun. I got some nice professional New Orleans photos for $12 and a gorgeous mini tophat with feathers for $15. Got a few recommendations for places to go and thing to see so that is always a plus. 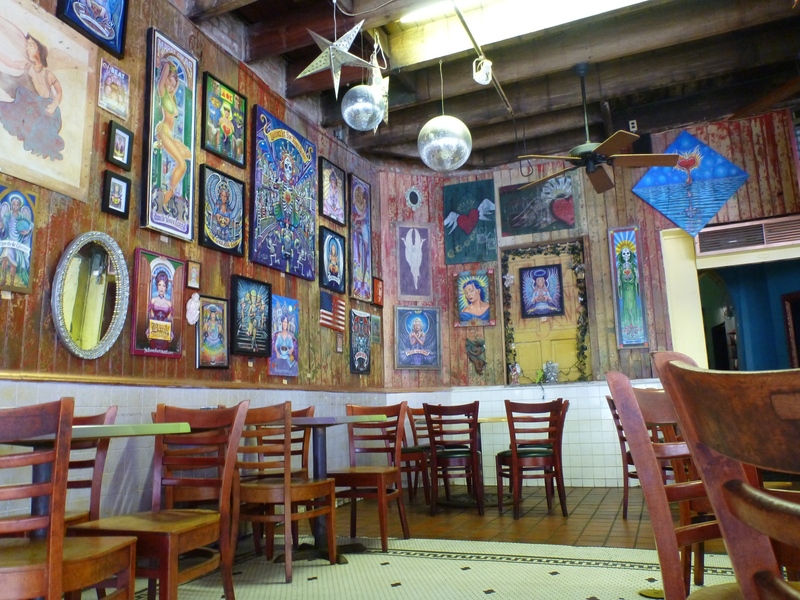 Enjoyed fairly good food at Angeli’s on Decatur st. 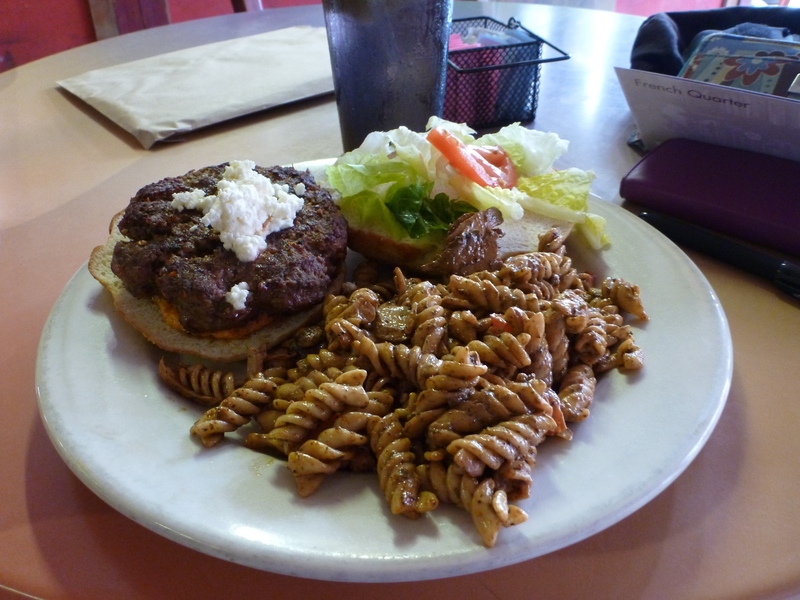 The pasta salad had rave reviews and I can taste why! The burger part was meh. I started using the Yelp mobile app in Los Angeles and it is very handy for finding good eats on the go. Or if I am craving something I can search for it. That’s how I found the Syrup dessert cafe in Los Angeles. 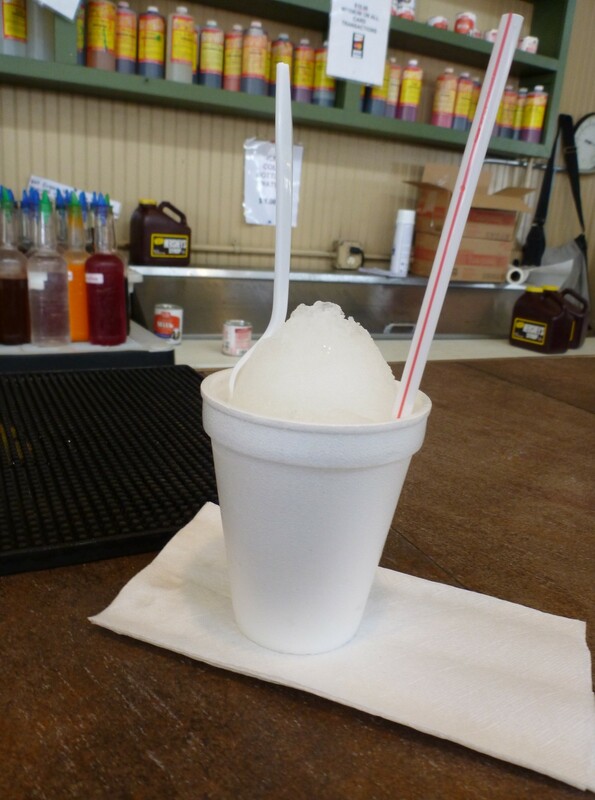 Snow ball with coconut flavouring. 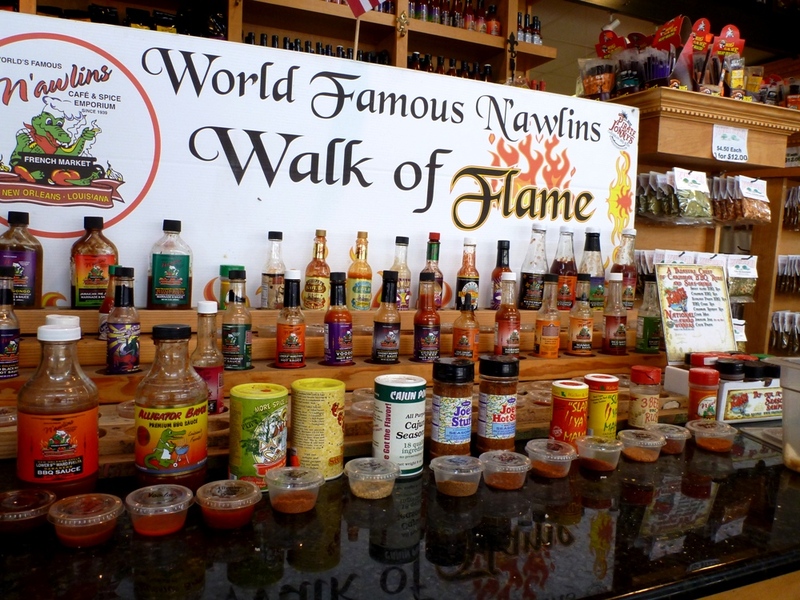 So good in the hot N’awlins weather! I went back to Abdulla’s place about 4pm and just hung out. He lives with a very friendly and quite fat cat named Annie. She is a little sweety and super cuddly, just climps onto you if you sit still too long. Abdulla is a very fun and kind guy, and an incredibly generous spirit. He’s traveled all over the place and has some great insights and just generally a very down to earth approach to life, and is delightfully hopeful. We get on famously. Well I do, and he didn’t kick me out the house so I guess that is a win for me too. We had another couch surfer come and stay with us too, an American guy called Devin. He is roadtrippin’ and was passing through town. There was only one couch and luckily I asked first so I got it, poor Devin got the comfy carpet. We couchsurfers are a grateful bunch though (or we ought to strive to be) so I don’t think he minded a whole lot. I wouldn’t have minded if it had been the other way around. We then headed out for the evening. we picked up Abdulla’s friend Angela, who is a nurse. She was great fun, it has to be said! very warm and welcoming to us strangers. 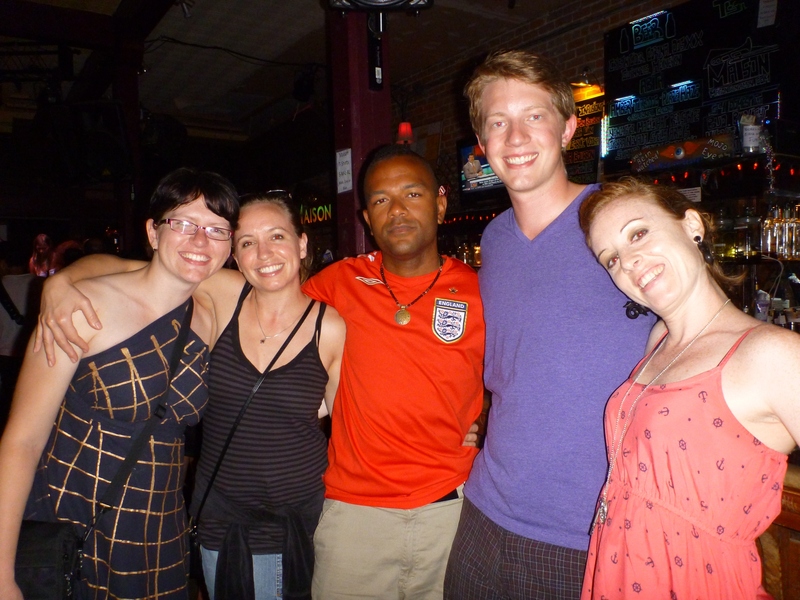 We found a park and went to Frenchman St, which is where the locals go to get their live music fix. Bourbon st is super touristy and a lot more expensive too. As soon as we arrived there was music spilling out from every venue and people every where…would be crazy to see it on a Saturday night! There was a band playing in the street, and good times coming from every side. Angela picked up her friend Hiroshi from one of the venues and we went off to find him some snacks/dinner. One place was serving tacos so he grabbed some of those. We moved on to another venue and got the first round of drinks. No one asked for ID so it was all good. In the area you can carry your drinks around, so we kept walking with plastic cups of cocktails and beer in hand. 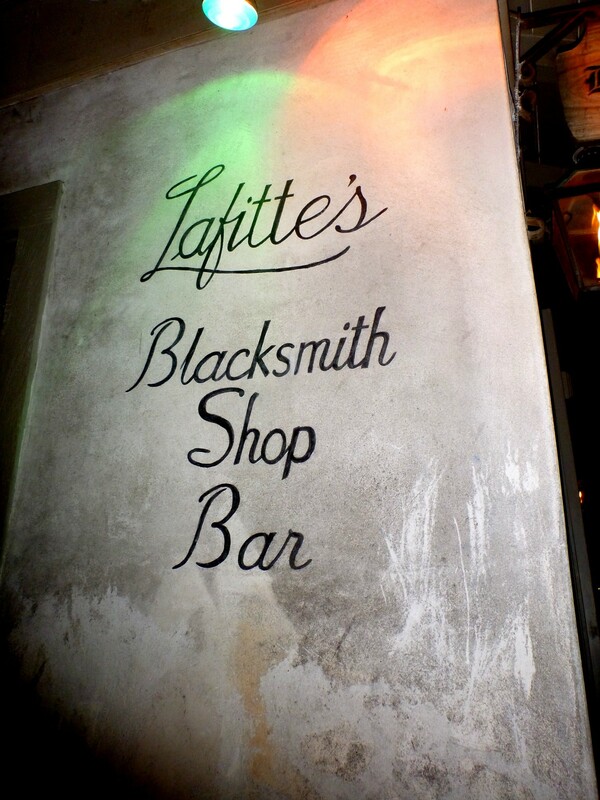 A brief detour to Bourbon st where the guys got “hand grenades”, a mix of alcohol, sugar and colouring, and then down to Lafitte’s Blacksmith Bar which is one of the oldest buildings in NOLA and I think I heard used to be a pirate hangout. We were a party of five now and the place was fairly busy, so we started stealing chairs to fit around a table designed for three. There was a pair of people sitting at the table next to us who invited us to share their giant round table. Over the course of the next few hours we became a party of seven. Yay for making impromptu friends! Amie and Jeff were friends visiting from Florida on a short holiday and were fun to hang out with. 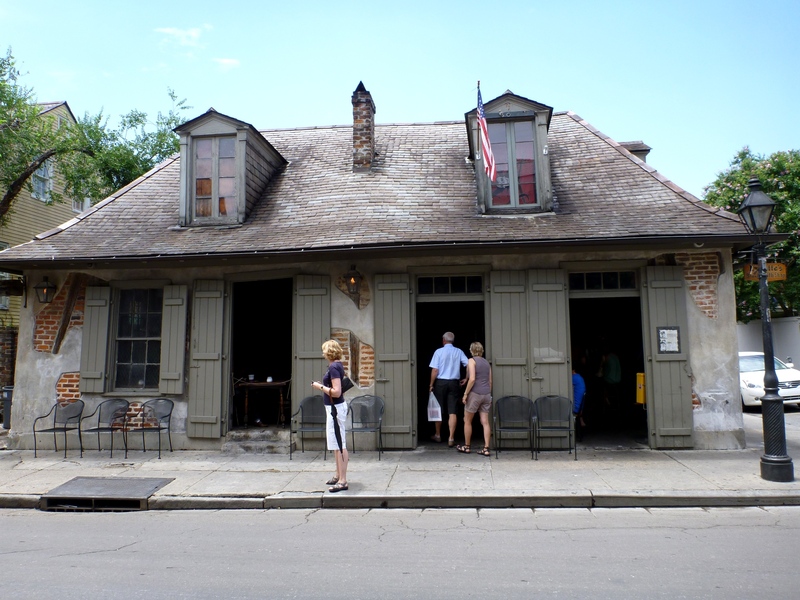 We had a few more rounds of drinks and then went back to Frenchman where we danced and partied until the very early hours. Our party slowly broke up and in the end Abdulla, Devin and I stumbled our way to Clover Grill on Bourbon st. I’m sure we were awfully loud, especially when Abdulla and Devin started miming/air guitar/air piano to Bohemian Rhapsody coming from the speakers. Still, those friend eggs were amazing. Cab home, and Abdulla decided he wanted more eggs so we cooked up a storm. They were some of the best eggs I have ever made. At least, that’s what my addled brain remembers. 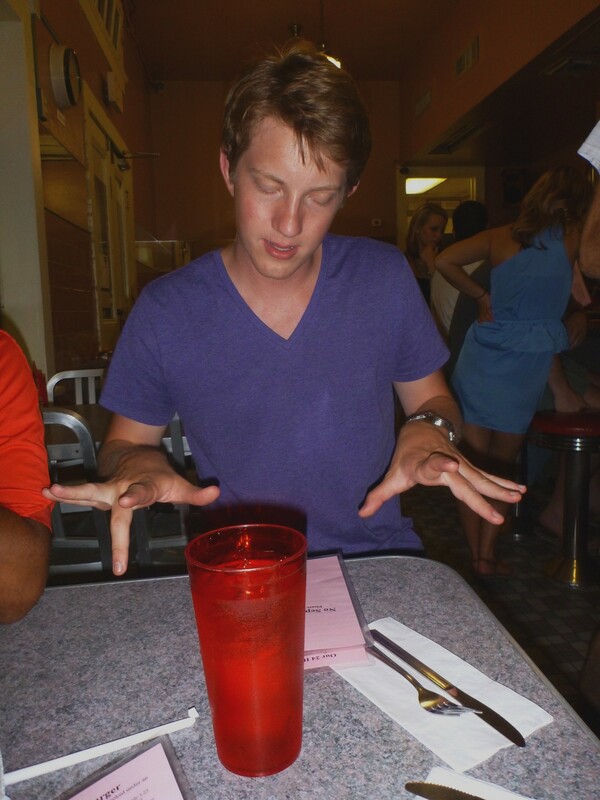 This entry was posted on June 21, 2013 by Kodiko in Life, Travel, USA 2013 and tagged bourbon st, couch surfing, drunken cooking, frechman st, louisiana, new orleans, NOLA, party, things to do in, visitor.